Sentinel’s proposed orbit, from which it will hunt for near Earth asteroids (Credits: B612 Foundation). Ball Aerospace & Technologies Corp. and the non-profit B612 Foundation have signed a contract for Ball to create prototype infrared imaging sensors for the Sentinel Mission, a deep space mission to protect Earth by providing early warning of threatening asteroids. Ball’s detector design characterization initiates the first phase of developing Sentinel’s 20-inch diameter, space-based infrared telescope. Sentinel is led by B612, a group of highly regarded scientists and explorers whose goal is to build, launch, and operate the first privately funded deep space mission. The mission will create a comprehensive and dynamic map of the inner solar system to catalog 90 percent of the asteroids larger than 140 meters in Earth’s region of the solar system. The map will detail the paths of asteroids during the next 100 years to provide decades of notice of threatening asteroids on a collision course with Earth. Ball’s advanced detector technology is responsible for many of the most spectacular space images ever taken, including those returned by the Kepler mission, the Spitzer and Hubble Space Telescopes, the Deep Impact mission and the HiRISE camera aboard the Mars Reconnaissance Orbiter. These missions developed flight proven deep space systems that will be used to minimize the technical and programmatic risks on the Sentinel mission. Ball’s state-of-the-art Detector Technology Center which opened in 2006 will play a critical role in producing the Sentinel camera. “Sentinel is unique because it relies on proven systems that will now be leveraged for a privately-funded mission,” said Cary Ludtke, vice president and general manager of Ball’s Civil and Operational Space strategic business unit. The B612 Foundation recently announced the formation and initial findings of its Sentinel Special Review Team (SSRT). The SSRT’s first charge was a review of the technical requirements and management structure for Sentinel and proposed plan evaluation. This successful review was conducted September 11-13 in Boulder, where the Sentinel spacecraft will be built. 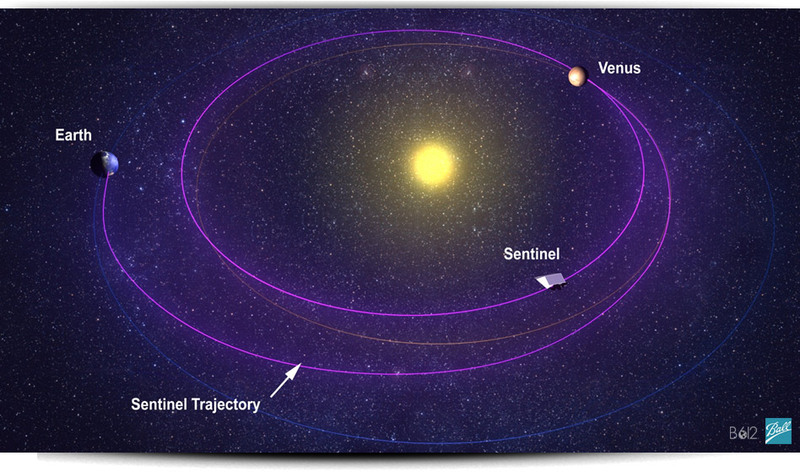 Sentinel will launch into a Venus-like orbit around the sun, which significantly improves the efficiency of asteroid discovery during its 6.5-year mission. By creating a map of the solar system in Earth’s neighborhood, Sentinel will enable future robotic and manned exploration. The mission data will also detect and track myriad objects potentially hazardous to humanity, and provide decades of warning of impending impacts, enough to easily deflect threatening asteroids using existing technology. To date, only about one percent of the nearly one million asteroids that could potentially hit Earth with devastating consequences have been observed and tracked. In just the first few weeks of operation, Sentinel will surpass this total, and during the first five years of operation, is expected to discover 50 times more near-Earth asteroids than have been found by all other telescopes throughout history combined. Sentinel will take approximately five years to complete development and testing, to be ready for launch in 2017-2018. B612 Sentinel aims to build, launch, and operate the world’s first privately funded deep space telescope to create the first comprehensive dynamic map of our inner solar system, identifying the current and future locations and trajectories of Earth crossing asteroids. To date, only about one percent of the nearly 1 million asteroids that could potentially hit Earth with devastating consequences have been observed and tracked. In just the first few weeks of operation, Sentinel will surpass this total, and during the first five years of operation, will discover 50 times more near-Earth asteroids than have been found by all other telescopes throughout history combined. Ball Aerospace will design and build the Sentinel Space Telescope, with the same expert team that built the Spitzer and Kepler Space Telescopes. Sentinel will launch in 2017-2018. Through a Space Act Agreement with NASA, data will be collected and sent back to Earth via NASA’s Deep Space Network, which also will be used for tracking and navigation. Ball Corporation (NYSE: BLL) is a supplier of high quality packaging for beverage, food and household products customers, and of aerospace and other technologies and services, primarily for the U.S. government. Ball Corporation and its subsidiaries employ more than 14,500 people worldwide and reported 2011 sales of more than $8.6 billion. For the latest Ball news and for other company information, please visit http://www.ball.com. Tagsasteroid hunterasteroidsB612 FoundationBall Aerospacedeep space missionNASAnear Earth asteroidorbitPHApioneerpotentially hazardous asteroidSentinelSentinel Space TelescopesolartechnologytelescopeU.S.